Today is June 30. Halfway through the year 2011. Are you halfway through the goals you've set for this year? Late last summer, we noticed a feral cat hanging around. She was a tortoise-shell color, and very small, almost a kitten. Fall came, then winter, and she still hung around, but we could not catch her. Several other feral cats appeared. We began leaving dry cat food out on the front porch, and put out a small shelter for her to use in the cold. The food disappeared; the shelter was unused. Snow fell, the temperatures dropped and I worried for her survival. New England winters can be harsh. Late in the winter, we found that the trash in the garage had been disturbed. We put out cat food, and it was eaten. The next day, we put out a litter box. It was used. But no sign of a cat. A month passed, then six weeks, food gone, litter used. One night as I went out to put the trash in the bin, I heard a tiny "meow!" Soon, the meow was followed by a tiny cat -- the tortoise-shell. After a time, she would let me pet her. Eventually, I caught her, got her into a cat carrier and to the vet for the works...shots, worming, neutering, a microchip, full health check. Home again, and into a separate room so that she could recover and then grow accustomed to the resident cat, Dempsey, and he to her. We named her "Treackle" as her color was reminiscent of a syrup, treacle, that we loved in England. After a few weeks, she began to explore the rest of the house, and the inevitable conflicts between the resident and newcomer began. We expected them, and were prepared for the growling, hissing and posturing. My mom, however, was not. She decided she did not like the cats and chased both of them out while trying to get only Dempsey to leave (in her words, "that old, mean, nasty thing"). She has Alzheimer's and could not realize that both cats would go when she yelled at them. Treackle was not fully integrated into the house yet, and headed for the woods, where she stayed, becoming more feral every day. Dempsey, of course, spent a few hours out and came home in time for his dinner. So, for over a month, we did not see Treackle at all. Her small size, at 5.5 pounds, made her a target for the local owls and coyotes. We worried. Then, after 6 weeks, we spotted her! She would not come when called, but we put food out on the porch and she ate it every day. So did several other feral cats and even, one night, a small raccoon. We could hear her yowling at other cats sometimes. We hoped. Two nights ago, she got into the garage again. Maybe she just wanted to come home after all. From the garage, she waltzed into the house and into her special room. And, once again, we will have to go through the growling, hissing, and adjustment period. Treackle seems more contented this time around. So does Dempsey, so the fighting may not be so bad. Now, if I can ONLY keep my mother away from the door. Lately, most of my studio time has been in dealing with the overwhelming stash issue. 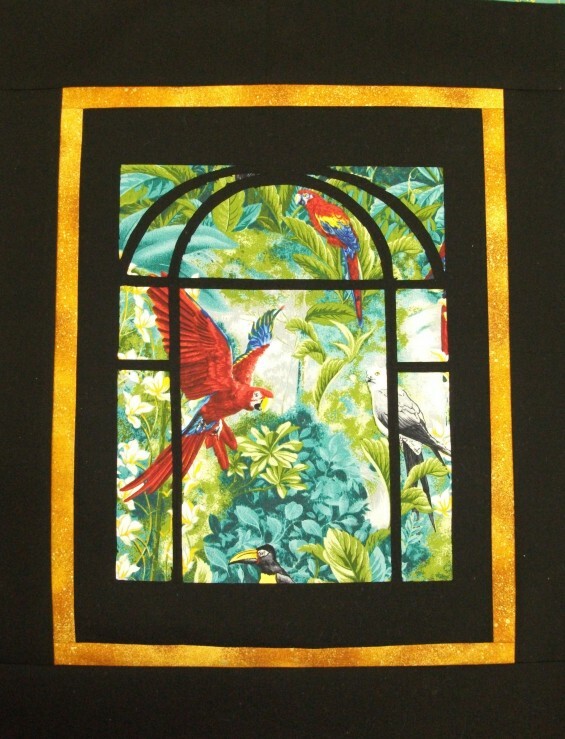 But, fear not, I have had a bit of time to sew. I've forced the issue a bit by signing up for some on-line classes, which are always fun. The first one is free-form seashells with very tiny stippling in between the shells. 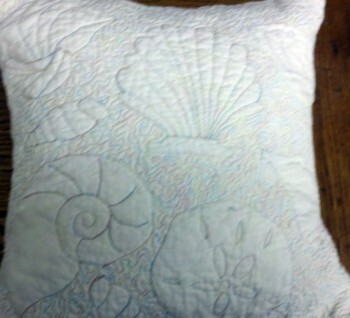 The stitching was done with Superior Threads Rainbows in a pale pastel combo. 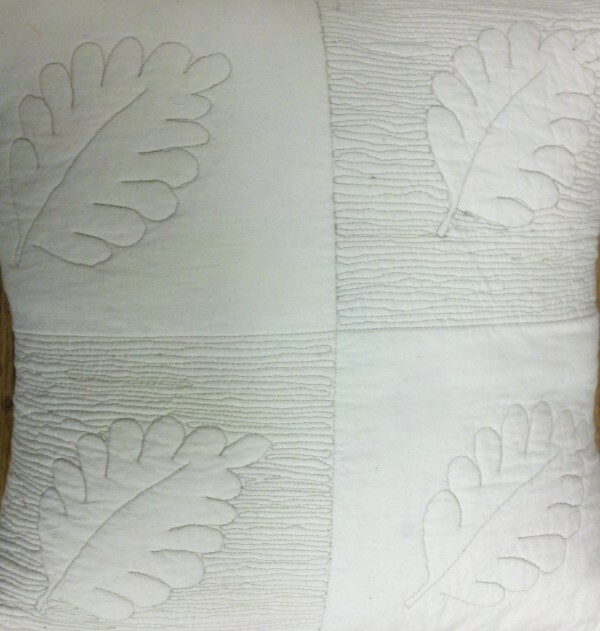 The second is four free-form leaves with close stitching on two of the quadrangles. The thread in this one is a taupe variegation. My DGS will be entering college this fall, majoring in Professional Photography. 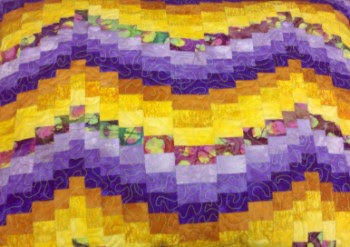 He'll be living in a dorm, so I've pieced a quilt for him in his favorite color: orange. As soon as the rain stops, I'll get a photo of that up and on the blog. 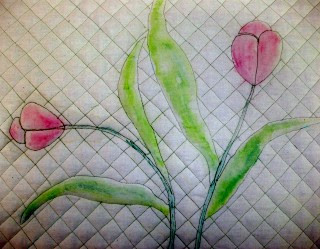 As rainy as it has been lately, I may actually have it quilted and bound before the weather clears! My peach-faced conure, Parker, is moulting. Every year, he loses feathers and grows new ones over the course of a month or so. When he has pinfeathers on his neck and head, he really gets cranky...they must itch. Here is a photo of him, looking disheveled and cross on his version of a bad-hair day. 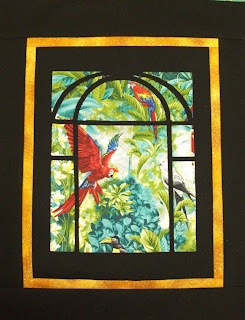 A few weeks ago I signed up for a stained glass class at Quilt University. The on-line class was great fun and this easy-as-pie little quilt was my result. I just love this brief video of geese in a marching band. They are so well organized! I'm at it again. Clearing away "stash" and trying to find sanity at the bottom. I've been taking apart old kits from when I owned the PPPatch, and there is so much "stuff" that some days I can't help but feel overwhelmed. I've pulled together 20 or so big plastic bins and marked the items with real bargain basement prices. YLI silk ribbon lengths, by the yard, at 6 yards for $1.00. Tons of laces, from 10 to 25 cents per half yard. Beads, 25 cents for mixes that have at least 1/2 hank of beads, but a charm or two, or buttons, whatever. Some of the packs have a whole hank of bead soup. Two HUGE bins of fabrics, almost all silks, for free. Even with all the bins that I've done, there is so far to go. I'm hoping a huge garage sale will help. That and a dumpster. Anyone out there want a squishy? Ten? Pay the postage and I will build your stash fast!